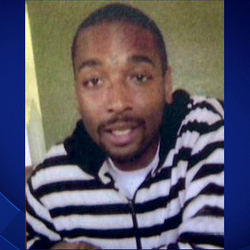 When police conducted an "investigative stop" of 25-year-old Ezell Ford on a Los Angeles sidewalk, he "wheeled around and basically tackled the lead officer," then went after his weapon, an LAPD spokesperson told the LA Times. But in an interview with KTLA News, a woman who identified herself as Ford's mother said he was lying on the ground, complying with the officers' orders, when he was shot in the back. On Sunday afternoon, a handful of people protested the shooting outside LAPD's headquarters. The LA County District Attorney and the department's Force Investigation Unit are looking into the shooting. On August 3, 2016, two Los Angeles police officers involved in this shooting sued the, alleging they are being kept from returning to field duty due to racial discrimination and retaliation. Demonstrators briefly halted the Los Angeles Police Commission’s weekly meeting Tuesday, August 11, 2015 as they chanted and called for criminal charges against two officers who fatally shot Ezell Ford a year ago.